You’ve found a really good quote and want to share it with the world? It’s easy to do with click.to. 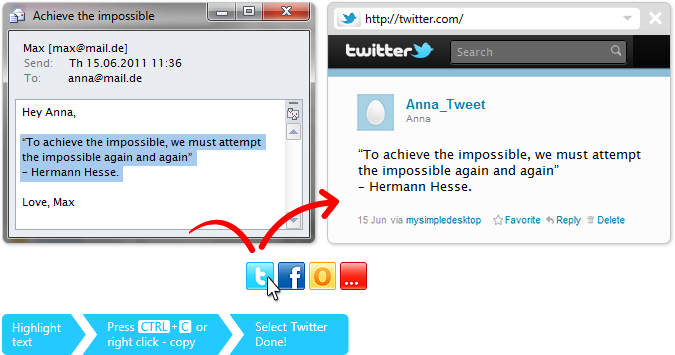 Simply mark the quote, copy using Ctrl+C and click.to Twitter. You only have to write one Hashtag, when necessary. Tweets can be up to 140 characters long. Most web links go beyond this framework, however, not to mention all the accompanying comments. Developed especially for this reason: Click.to TinyURL. It sounds very complicated until you’ve tried it the first time with click.to: Highlight website link, Ctrl+C and copy to click.to TinyURL. The link will now be shortened and processed automatically in the background. 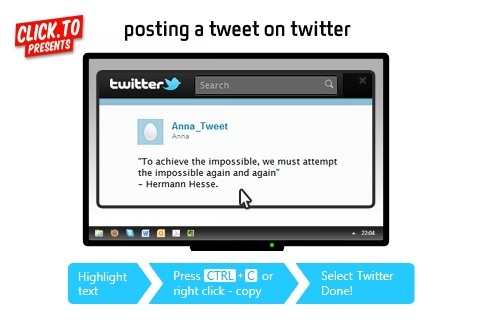 With another click on click.to Twitter, the shortened link will immediately be tweeted to your account.